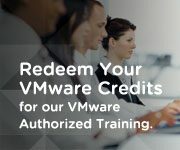 VMware Certified Design Expert (VCDX) is the highest level of VMware certification. This elite group of VCDX professionals is comprised of design architects highly-skilled in VMware enterprise deployments. Prove you can deliver true business value by validating your expertise in vSphere6.x and enabling the best performance, availability, and efficiency from your infrastructure and applications. Review and understand the blueprint. Select and build a design, based on the guidance in the handbook. Submit and pass application and design review. Successfully defend the design against three panelists. Successfully defend the design in a one-hour phone interview.